Their approach uses nanometre-thick films made of gallium arsenide, which is a semiconductor material widely used in solar cells. 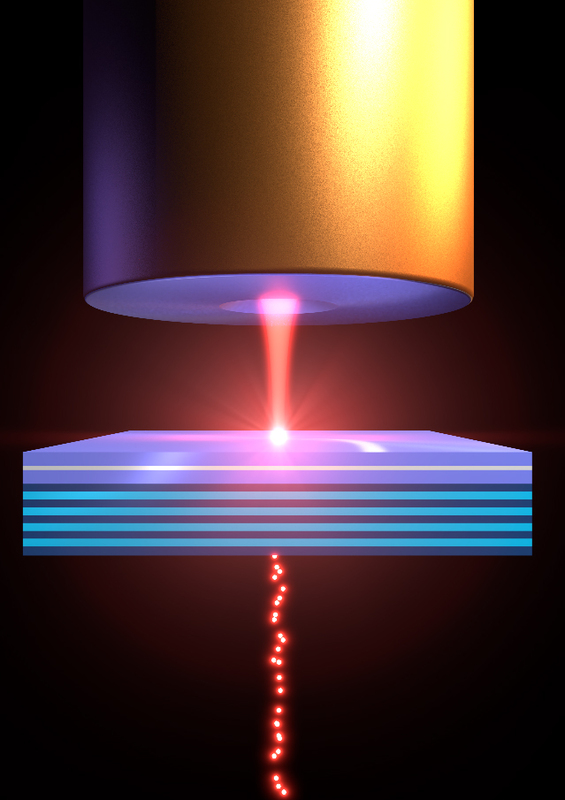 They sandwich the thin films between two mirrors to manipulate the incoming photons. The photons interact with electron-hole pairs in the semiconductor, forming new chimeric particles called polaritons that carry properties from both the photons and the electron-hole pairs. The polaritons decay after a few picoseconds, and the photons they release exhibit distinct quantum signatures. The teams’ research was published overnight in the journal Nature Materials. While these quantum signatures are weak at the moment, the work opens up a new avenue for producing single photons on demand. Currently single-photon emitters are typically created by materials engineering—where the material itself is assembled in such a way that the ‘quantum’ behaviour is built in. But this standard approach faces serious limitations at smaller and smaller scales because producing identical single-photon emitters by pure materials engineering is extremely challenging. “This means our approach could be much more amenable for massively scaling up, once we’re able to increase the strength of the quantum signatures we’re producing. We might be able to make identical quantum emitters from semiconductors by photon nanostructure engineering, rather than by direct materials engineering,” says Dr Guillermo Munoz Matutano, also from Macquarie and lead author of the paper. “While real-world applications are still a fair bit away, our paper describes a major milestone that the polariton community in particular has been waiting on for the last ten to fifteen years. The regime in which polaritons interact so strongly that they can imprint quantum signatures on photons has not been accessed to date and opens up a whole new playground for researchers in the field,” says Thomas. The Macquarie University team is part of the ARC Centre of Excellence for Engineered Quantum Systems (EQUS), and the experiments were carried out at the CSIRO labs in Lindfield where part of the Macquarie quantum labs are based at present. The paper appears alongside a similar study carried out in parallel at ETH Zurich. Muñoz-Matutano G, Wood A, Johnsson M, Vidal X, Baragiola BQ, Reinhard A, Lemaître A, Bloch J, Amo A, Nogues G, Besga B, Richard M & Volz T. Emergence of quantum correlations from interacting fibre-cavity polaritons. Nature Materials. February 2019.